Just wanted to post these pics to show off some of my builds with Wave 18. Those builds are so weird and great!!! The scarves around the eyes are genius. These are some deliciously monstrous builds, Witchwitchwitch! How many sets did you use to make them? kranix wrote: The scarves around the eyes are genius. These are some deliciously monstrous builds, Witchwitchwitch! How many sets did you use to make them? Thanks Kranix! I think total I've got 2x all 4 colorways of Wave 18. So that's 4 Bio-Masters and 4 Kabuto Mushi, however as you can tell there are a few unaccounted for in these pics and there a complete Zeta in my favorite Mushi build. Wave 19 tonight 03/05/17 @ 8pm CST...special guest "Scarab Hunter" Callgrim!!! Would you call that Metallic Lime? Wow, did not expect to see ol' Skullface again. Those are some cool combined builds, Marty! Really diggin' that kabuto horn! HUGE THANX 2 everyone that placed an order for Wave 19!!! Just realized that I'm already 3 months into my 4th year of production toyz!!! I truly appreciate the incredible support of the Glyos community in making my toyz a success! Every single order was shipped 3/6/17...there were so many packages this time, my son MJ decided to help me all night and even lug all the crates to the USPS at midnight...gonna be one exhausted senior at school tomorrow. 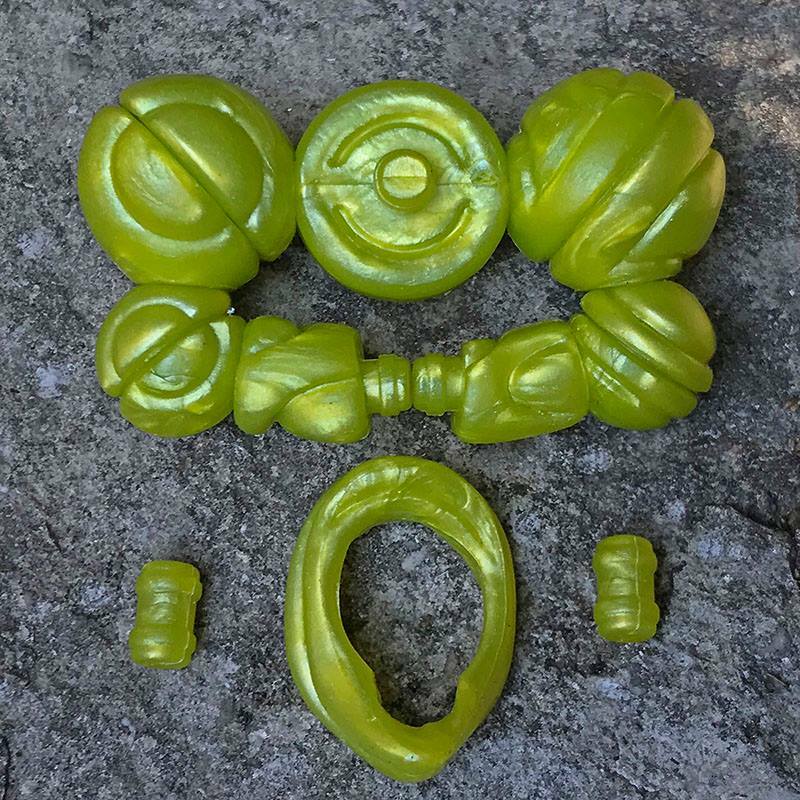 btw, there is literally 2 Glyos Axis Joint sets left, Low Stock of X-Ray Scarab & Scarab Elite... with Neo Nonillia & Callgrim quickly approaching Low Stock as well! Doesn't appear that anyone is having issues connecting because during Wave 19 release tons of orders came through no problem (even into last & today). Feel free to contact me via email @ thegodbeastcustoms@gmail.com if you want to place an order. Everything from Wave 19 is "Low Stock" & Glyos Axis Joints are 100% SOLD OUT. I know for a fact I can't connect to any of the stores using my work wifi, but I can definitely connect using 4g or my personal wifi. All of Wave 19 is "LOW STOCK!!!" 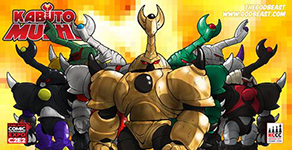 These brand new Bio-Mass Monster figures will join the fray along side Matt Doughty's Onell release and Marty Hansen's latest Kabuto Mushi wave! Kabuto Mushi Wave 20 "Cosmic Instars." 04/28-04/30 at Kansas City Planet ComiCon in Bartel Hall Convention Center in downtown KC!!! Jeebus! Another glyos related drop in as many days! Whatta month! Nezumiiro wrote: Jeebus! Another glyos related drop in as many days! Whatta month! I release 6 times per year (every other month) and this is currently my 4th year in production. Wave 19 was March 5th, so Wave 20 April 28th is actually almost 2 months (54 days to be exact) since my previous wave. Before my March 5th Wave 19 release I had December 16th Wave 18 release, which was almost 3 months (79 days to be exact) in between waves. Keep in mind, I've made toys for a living since 2002. I wonder how many collectors could go 2-3 months in between pay checks. 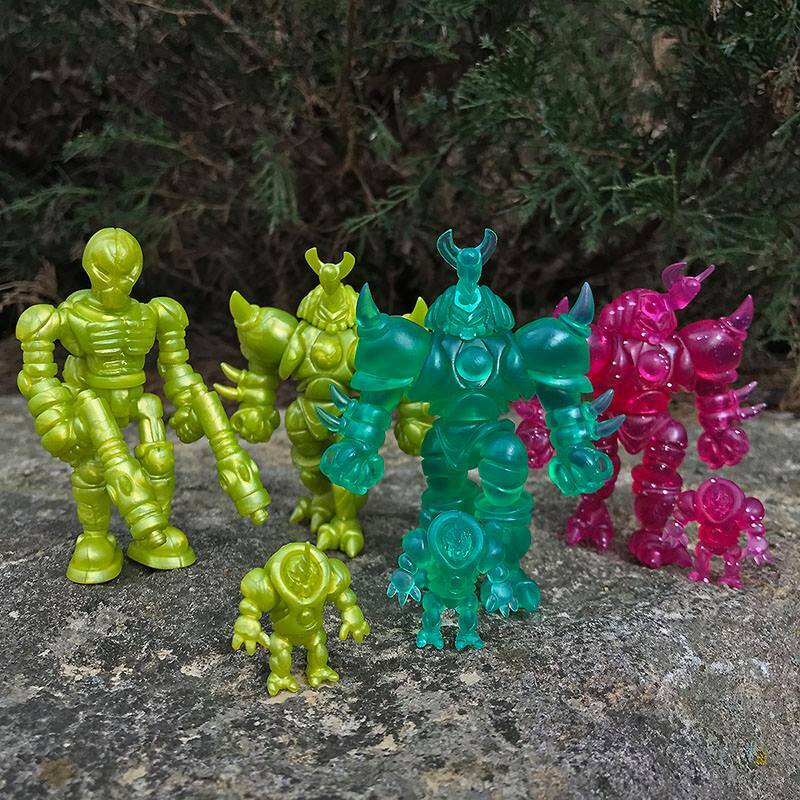 ULTRA LIMITED UNPAINTED SET of "Cosmic Instars"
Oh I didn't mean anything derogatory by it, I just didn't expect April, for all intents and purpose, to be such a prolific Glyos month! Ultimately, it's a way-nice surprise! Guess I could have worded that a bit better! No worries Nez...I probably sounded a bit defensive. I am extremely conscientious of my timing of releases. Even going every other month for going on 4 years (6 times a year), 75% of the time now I am releasing within a week or so in the middle of 2 other company releases. I try my best though. No offense taken my friend, just wanted to take the opportunity to explain/expand upon my schedule. Maybe see you tonight for some Cosmic Instar action? Well, I originally was seeing these guys as glowing with energy, but now that I know the official colors I can't help but think of them as hard candy KM mutants. I can't wait to get a couple of these in hand! THEGODBEAST wrote: Maybe see you tonight for some Cosmic Instar action? Definitely! I just took your last Blister, Blister Reverse, and Darkling Mushi!